Michael Roderick and Mood Area 52 have engineered many other spinoff musical projects including Wheel of Meat, a second line brass band, several tributes to Buster Keaton featuring live original scores, The Electric Guitar Orchestra, a large, loud group of electric guitarists featuring adapted classical music, and seasonal productions of John Zorn's "Cobra". Roderick has worked with Marietta Bonaventura on the annual Eugene Tom Waits Tribute. 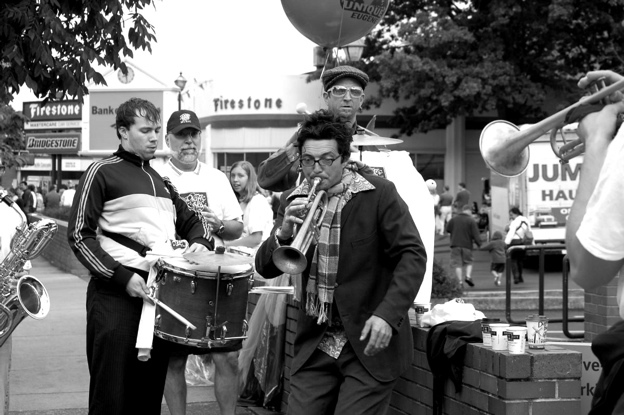 The band has performed entire Tom Waits albums including "Alice" and "Rain Dogs." Mood Area 52 also did an 80th birthday celebration for Henry Mancini as "Manischewitz" featuring the film score mastermind's compositions. A trio featuring Michael Roderick on sousaphone and vocals, James West on drums, and JAke Pavlak on electric guitar. Jake is the mastermind behind pop sensations Yeltsin. James and Michael are good neighbors an collaborators in many other Rocketboy Arts projects. Guevara's Ghost is collaboration between Mood Area 52, a Northwest tango orchestra, and producer Cosmos Corbin, combining the collected talent of Mood Area 52 with Cosmos' beats and keyboard work. Groups such as Gotan project and Narcotango have made the connection between tango and electronic music, but Guevara's Ghost breaks new ground. The album works within the tight, organic song structures of Mood Area 52's original compositions, while exploring themes inspired by the spirited and idealistic character of Ernesto Che Guevara. Cosmos Corbin, a member of the nationally acclaimed production trio Raging Family, was inspired to work with Mood Area 52 after listening to their music and contemplating the music's roots as dance music. He had recently returned from a trip to Cuba, and wanted to create a sound which recontextualized tango music using abstract hip hop rhythms, glitchy micro-sampling of the original tango compositions, deep bass tones, and subtle electronics, Cosmos combined the cut and paste aesthetic of musicians such as Prefuse 73, Boom Bip, and Raging Family, with the soul of Argentine tango music. Roderick recently spent time in Buenos Aires promoting Mood Area 52 and gathering ideas for Guevara's Ghost. He was interviewed on Argentina's national public broadcast network and garnered radio play on commercial stations. Music from Guevara's Ghost will be used in an upcoming documentary on the life of Che Guevara called "Imagen del Hombre Nuevo." It is not that we think that in the practical order of revolutionary struggle his death is to have immediate repercussions, it is that El Che, upon taking up arms again, was not thinking about an immediate victory, he was not thinking about a swift victory against the forces of the oligarchies and of imperialism. His experienced guerrilla mind was trained for a long struggle of 5, 10, 15 or 20 years if necessary. And he was ready to struggle 5, 10, 15, 20 years, his whole life, if necessary, and it is with this time perspective that his death – his example, I ought to say – will have a tremendous repercussion, will have an invincible influence. In vain they try to deny his ability as a commander and his experience, those who cling to the stroke of luck. Che was a military commander who was extraordinarily capable, but when we remember El Che, when we think about El Che, we are not thinking basically about his military virtues. No, for war is a means to an end, war is a tool of revolutionaries. What is important is revolution, what is important is the revolutionary cause, the revolutionary ideas, the revolutionary objectives, the revolutionary sentiments, the revolutionary virtues. And it is in this field, in the field of ideas, in the field of sentiments, in the field of revolutionary virtues, in the filed of intelligence, aside from his military virtues, that we feel the tremendous loss for the revolutionary movement, because Che, in his extraordinary personality, had virtues which rarely appear together. He was outstanding as an incomparable man of action. Che was not only an incomparable man of action, but a man of profound intellect, of visionary intelligence, a man of profound culture. I mean to say he was a man of ideas and a man of action. However, it is not just that he was both a man of profound ideas and a man of action, but that as a revolutionary he had the virtues which could be defined as the most full-fledged expression of the virtues of a revolutionary, and integral man in the fullest sense of the word, a man of supreme honesty, of absolute sincerity, a man of stoic and Spartan life, a man in whose conduct practically no fault can be found. Because of his virtues he was what can be called a true model of a revolutionary. Speeches can be made when men die, virtues can be pointed out, but few are the times when, as on this occasion, what we say about Che, who was a true example of revolutionary virtues, can be said with more justice, more exactitude. In addition, he had another quality which is not a quality of the intellect, which is not a quality of will, which is not a quality derived from experience, struggle, but a quality of heart. He was an extraordinarily humane man, extraordinarily sensitive. That is why we say that, when we think about his life, when we think about his conduct, this was the case of a very rare man, because he was able to blend in his personality not only the characteristics of a man of action but also those of a thinking man, a man of shining revolutionary virtues and extraordinary human sensitivity blended with a character of iron, a steel will, and indomitable tenacity. That is why he was willed to future generations not only his experience, his knowledge as an outstanding soldier, but also the work of his intelligence. He wrote with the virtuosity of a classicist of the language. His narrations of the war are unsurpassable. The profundity of his thinking is impressive. He absolutely never wrote on anything without extraordinary seriousness, without extraordinary profundity. We do not doubt that some of his writings will pass on to posterity as classical documents of revolutionary thinking. And so, as a fruit of that vigorous and profound intelligence, he left us an infinite number of memories and stories which, without his work, his effort, would perhaps be forgotten forever. A tireless worker in the years that he was at the service of our country, he did not know one single day or rest. Many responsibilities were assigned to him, such as the presidency of the national bank, the directorship of the planning board, the Ministry of Industry, as a commander of military regions, as a chief of delegations of a political, economic or fraternal type. His multifaceted intelligence was capable of undertaking any task with a maximum of assurance in any field, in any way of thinking. And thus he represented our country in a brilliant manner in many international conferences. In the same manner that he brilliantly led soldiers in combat, in the same way he was a model worker in any of the institutions to which he was assigned. For him there were no days of rest, no hours of rest. If we looked at his office window the lights burned until late at night. He was studying or, better said, was working because he studied all the problems. He was a tireless reader. His thirst for knowledge was practically insatiable, and the hours he did not sleep, he studied. He dedicated regular days off to volunteer work. He was the inspiration and the top promoter of that work which today occupies hundreds of thousands of persons throughout the nation. He was the promoter of that activity which daily grows stronger among the masses of our people. As a revolutionary, as a communist revolutionary, really communist, he had infinite faith in moral values, he had infinite faith in the conscience of men and – we ought to say it – in his conception he saw with absolute clarity that morality was the basic fulcrum for the construction of communism in human society. He thought, developed, and wrote about many things. And there is something that ought to be said on a day like this. It is that Che’s writings, Che’s political and revolutionary thoughts, will have a permanent value in the Cuban revolutionary process and the revolutionary process of Latin America. And we have no doubt that the value of his ideas – of his ideas as a man of action, as a man of thought, as a man of proved moral virtues, as a man of extreme human sensitivity, as a man of irreproachable conduct – have and shall have universal value. The imperialists sing victory songs over the fact of the guerrilla killed in combat. The imperialists sing of victory over the stroke of fortune which led them to eliminate such a formidable man of action. However, the imperialists perhaps ignore or pretend to ignore the fact that the quality and personality of this fighter, man of action, was one of many facets. It is a question of pain – we feel pain not only over what has been lost in terms of a man of action, we feel pain over what has been lost in terms of a virtuous man; we feel pain over what has been lost in terms of a man of exquisite human sensitivity; and we feel pain over the intelligence which has been lost. It pains us to think that he was only 39 at the moment of his death. It pains us to think of how many of the fruits of that intelligence and that experience, which was developing all the time, we have lost the chance to perceive. We have ideas of the dimension of the loss to the revolutionary movement. Nevertheless, this is the weak side of the imperialist enemy. Thinking that, along with the physical man, it has liquidated his virtues; thinking that, along with the physical man, it has liquidated his example. And they do not hesitate in publishing in such an impudent manner, as the most natural thing in the world, the circumstances – now almost universally accepted –in which he was executed by them after having been seriously wounded in battle. They have not even reflected on the loathsomeness of the action. They have not even reflected on the impudence of the admission. And they have publicized, as the right of the thugs, they have reported, as the right of the oligarchs and the mercenaries, the act of firing at a revolutionary fighter who was seriously wounded. What is worse is that they also explained why they did it, claiming that it would have required an overwhelming process to try him; claiming that it would have been impossible to place such a revolutionary in the dock of a court. Not only that, they also have no hesitated in secreting his remains. And, true or false, it is a fact that they announce having cremated his body, thereby demonstrating their fear, thereby demonstrating that (?they believe that) by liquidating the physical life of the fighter, they liquidate his ideas and liquidate his example. Che did not fall defending any interest, defending any cause other than the cause or the exploited and the oppressed in this continent. Che did not fall defending any cause other than the cause of the poor, the humble, of this land. And the exemplary manner and the selfishness with which he defended that cause are not even debated by his greatest enemies. Before history, the men who acted as he did, the men who do everything and give everything for the cause for the humble, become greater with every passing day; they enter deeper into the hearts of the peoples with every passing day. And the imperialist enemies are already beginning to perceive this. They will not be long to realize that his death will in the long run be like a seed from which will emerge many men determined to emulate him, many men determined to follow his example. And we are absolutely convinced that the revolutionary cause in this continent will recover from the blow, that the revolutionary cause in this continent will not be defeated by that blow. From the revolutionary standpoint, from the standpoint of our duty, how should we view Che’s example? Do we perhaps believe we have lost him? It is true that we will not again see new writings. It is true that we will not again hear his voice. But Che has left the world a patrimony, a great patrimony. And from that patrimony we who know him so intimately can to a considerable degree be his heirs. He left us his revolutionary thoughts. He left us his revolutionary virtues. He left us his character, his will, his tenacity, his spirit for work. In a word, he left us his example. And Che’s example should be a model for our people. Che’s example should be the ideal model for our people. If we want to say how we want our revolutionary fighters, our militants, our men to be, we should say without any hesitation: Let them be like Che. If we want to say how we want the men of future generations to be, we should say: Let them be like Che. If we want to say how we want our children to be educated, we should say without hesitation: We want them to be educated in Che’s spirit. If we want a model of a man, a model of a man who does not belong to this time, a model of a man who belongs to future times, from the hearts, I say that the model, without a single blemish in its conduct, without a single blemish in its attitude, without a single blemish in its actions – that model is Che. If we want to know how we want our children to be, we should say, with all our (revolutionary mind) and heart: We want them to be like Che. Che has become a model of man not only for our nation, but for any Latin American nation. Che raised revolutionary stoicism, the spirit of revolutionary sacrifice, the combativeness, the working spirit of the revolutionary to their highest expression. Che gave the ideas of Marxism-Leninism their freshest, purest, most revolutionary expression. No man like him in these times has raised the spirit of proletarian internationalism to its highest level. And when one speaks of a proletarian internationalism and when one seeks an example of a proletarian internationalist, that example, above any other example, is the example of Che. In his mind and in his heart, the flags, the prejudices, the chauvinisms, the egoisms had disappeared. He was willing to shed generously his blood for the fortune of any people, for the cause of any people. He was ready to shed it freely, ready to shed it instantly. And so his blood was shed in this land where he was wounded in various battles. His blood was shed in Bolivia for the redemption of the exploited and the oppressed, the humble and the poor. That blood was shed for all the exploited, for all the oppressed. That blood was shed for all the peoples of America, and it was shed for Vietnam, because he knew that, in fighting against imperialism there, he was offering Vietnam the highest expression of his solidarity. That is why, comrade ladies and gentlemen of the revolution, we should look to the future with firmness and determination. That is why we should look to the future with optimism, and we will always seek inspiration in Che’s example, inspiration for struggle, inspiration for tenacity, inspiration for intransigence before the enemy, and inspiration for internationalism sentiment. That is why we, on this night, after this impressive ceremony, after this incredible – because of its magnitude, discipline and devotion – mass demonstration of recognition, which shows that this is a sensitive people, which shows that this is an appreciative people, which shows that this people knows how to pay homage to the memory of the courageous men who fall in battle, which shows that this people knows how to acknowledge those who serve it, which demonstrates how this people supports the revolutionary struggle, how this people raises and will always keep high the revolutionary banners and the revolutionary principles – today, at this moment of commemoration, we shall elevate our thoughts and, with optimism in the future, with absolute optimism about the final victory of the peoples, tell Che and, along with him, the heroes who fought and fell with him: to victory always! Fatherland or death, we shall win!